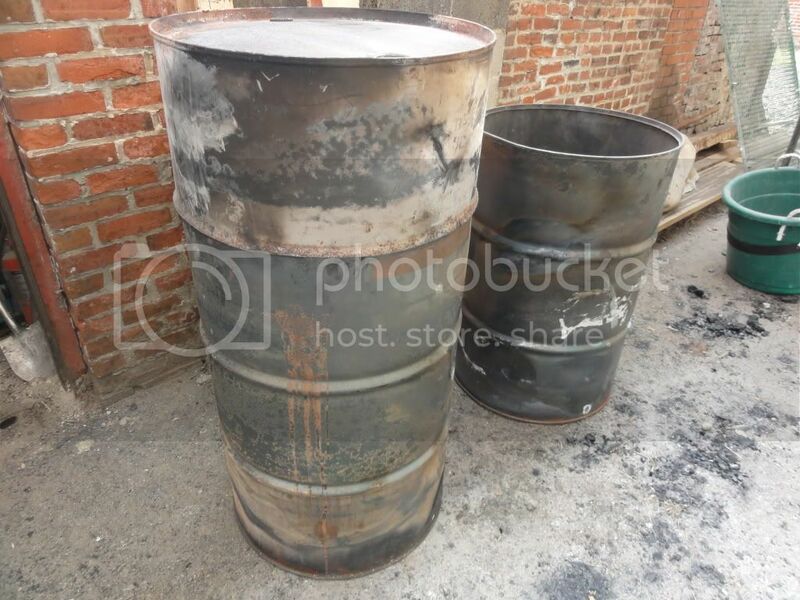 Ugly Drum Smoker - Page 529 - The BBQ BRETHREN FORUMS. There is engine paint primer from rustoleum to go with their top coat engine paint. I personally use primer anytime I paint on an unfinished surface. Having said that, I wouldn't burn that paint off unless you're just dying to paint it. It probably won't come off with just smoking. We just built one here a few weeks ago and the factory black paint is still perfect after an initial run up of heat to 400 degrees by accident when he did his fatty break-in. Hmmm, now there is an idea. There is some writing on the drum, but nothing I can't live with. Or maybe I'll just give the outside a good thorough cleaning and paint over it instead of burning it off. an easy hole for a temp probe is a drilled out valve stem (auto parts places usually have replacement metal stems to bling out your wheels). unscrew the valve from the center - and drill out the hole in the brass stem to the size you need. I have 2 different sizes on mine - one a bit larger to pass through the meat probe (which has a curve in it). Still the larger hole is not much more than 1/8" so no real air leakage. R2-BQ is getting a little notice in the Star Wars fan world.... with links back to here. Hey Mike(LoveBBQ) the reason 4 the 1st burn is not to take the paint off the out side. The reason is to sterilize the inside so that there are no gasses from whatever to contaminate the food. Not all bad gasses can be smelled or tasted. Sorry for the big words I don't belief in luck(why be ify) so good success with your smoker. Hi everyone! I'm new here and would just like to say how awesome this thread is! Thanks to this thread, I've been inspired to build my own UDS, and I will post pictures when the build commences. I'm just waiting on two food-safe drums. Thanks again...I look forward to being an active member. - J.
OK, good point. One of the reasons I don't want to do a full burn like I see on here is due to the area where I live. Perhaps just a high temp burn of some charcoal before seasoning will do the trick? Or use the weed burner on the inside? Zinc is only a problem in theory, in reality, zinc fasteners pose no problem. OK So I am building my first UDS. Drum is clean but I wanted a non-commercial lid so I cut a steel ring 1" wide the diameter of the drum and welded 2 1" strips to the bottom of it. I cut and rolled some sheet metal to form a cone that is chopped off at the top and will weld a plate flat on the top. the welded on inner ring should help the drip I keep seeing on everyone smoker from the runoff that comes from the lid. So here is my question. Will it actually work as designed or have I missed something? Sounds like an excellent plan! I've really struggled trying to find the perfect lid. On one, I use 1/3 of a drum, cut right at one of the ribs, which overlaps the top bead of the drum. It works well, and has a lot of room inside, but it is very heavy. In order to use a Weber lid, most drums are just a hair too big, and re-shaping the Weber lid results in the loss of the baked-on enamel- not good. I've also tried several large SS bowls, but haven't found one the right size. I've thought about making one the way you are, and it should work very well- if you can get a good seal. Air leaks at the lid make it very hard to get that low-n-slow burn the UDS is famous for. Pictures- PLEASE! Im making a couple of UDS lids from the bottom third of another drum. Not sure how it is gonna work out with the black drip though. de-stilled for the alcohol, the I SAY SO's said to put a poison in it to stop that practice. So, if my barrel had a poison in it, I'd want to burn it out good. Hope that helps. Finished my second UDS, just waiting for the paint to cure for a week before I season it.